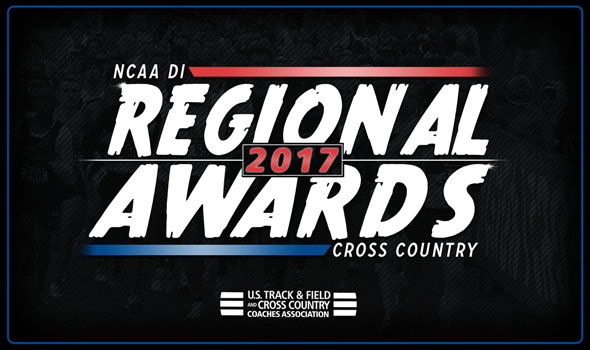 NEW ORLEANS – Regional Athletes and Coaches of the Year for the 2017 NCAA Division I Cross Country season were announced Tuesday by the U.S. Track & Field and Cross Country Coaches Association (USTFCCCA), as voted on by member coaches from that division. The 2017 NCAA Division I Cross Country Championships will be held Saturday, November 18 in Louisville, Kentucky. Flanagan, a senior from Kitchener, Ontario, Canada, won the Great Lakes Region title in 30:54.0. He also placed sixth at the Big Ten Championships and 22nd at the Nuttycombe Wisconsin Invitational. Green, a junior from Berlin, Massachusetts, won the Mid-Atlantic Region title in 30:28.3. He also won the individual title at the BIG EAST Championships and placed eighth at the Pre-National Invitational. Davis, a sophomore from Fithian, Illinois, won the Midwest Region title in 29:06.2. He also placed ninth at the Big Ten Championships and sixth at the Nuttycombe Wisconsin Invitational. Klecker, a sophomore from Minnetonka, Minnesota, won the Mountain Region title in 30:13.6. He also placed runner-up at the Pac-12 Championships and was ninth at the Pre-National Invitational. Knight, a senior from Vaughan, Ontario, Canada, won the Northeast Region title in 31:43.4. He also won individual titles at the ACC Championships and the Nuttycombe Wisconsin Invitational. Kigen, a junior from Kipkabus, Kenya, won the South Region title in 29:44.5. He also placed second at the SEC Championships and won the individual title at the Joe Piane Notre Dame Invitational. Rotich, a junior from Sotik, Kenya, won the South Central Region title in 29:49.1. He is undefeated this season, having won individual titles at five meets. Kipkoech, a junior from Eldoret, Kenya, won the Southeast Region title in 28:45.3. He also placed third at the Big South Championships and 23rd at the Pre-National Invitational. Roudolff-Levisse, a sophomore from Verrieres-le-Buisson, France, won the West Region title in 29:33.1. He also placed 11th at the Nuttycombe Wisconsin Invitational. Receveur, a junior from Louisville, Kentucky, won the Great Lakes Region title in 20:34.9. She also won the individual title at the Big Ten Championships and placed 10th at the Nuttycombe Wisconsin Invitational. Burda, a junior from Pleasant Valley, New York, won the Mid-Atlantic Region title in 20:01.5. She also won an individual title at the Penn State National Open and placed third at the BIG EAST Championships. Schweizer, a senior from Urbandale, Iowa, won the Midwest Region title in 19:50.9. She also won individual titles at three other meets and placed runner-up at the Pre-National Invitational. Kurgat, a sophomore from Eldoret, Kenya, won the Mountain Region title in 20:01.4. She also won individual titles at three other meets including the Mountain West Championships and the Nuttycombe Wisconsin Invitational. Purrier, a senior from Montgomery, Vermont, won the Northeast Region title in 21:20.8. She also won three other individual titles, including ones at the America East Championships and the Pre-National Invitational. Drop, a sophomore from Durham, Connecticut, won the South Region title in 19:40.9. She also placed fifth at the SEC Championships and 13th at the Pre-National Invitational. Hiltz, a senior from Santa Cruz, California, won the South Central Region title in 19:35.5. She also placed 12th at the SEC Championships and 20th at the Pre-National Invitational. Sang, a junior from Eldoret, Kenya, won the Southeast Region title in 20:05.8. She also won the individual title at the Conference USA Championships and placed sixth at the Pre-National Invitational. Taylor, a senior from Spalding, England, won the West Region title in 19:14.2. She also won the individual title at the West Coast Conference Championships and placed third at the Nuttycombe Wisconsin Invitational. Drenth, in his 14th year at Michigan State, led the Spartans to the team title at the Great Lakes Regional with 68 points. Additionally, the Spartans were conference runner-ups at the Big Ten Championships. Vigilante, in his sixth year at Princeton, guided the Tigers to a Mid-Atlantic Region title with 57 points. His program also took home the Ivy League championship. Smith, in his fifth year at Iowa State, guided the Cyclones to the Midwest Region championship with 69 points. Iowa State also won the Big 12 Championship. Smith, in his first year at Northern Arizona, coached the Lumberjacks to a Mountain Region title with 49 points. His squad also picked up a conference title at the Big Sky Championships. Fox, in his 13th year at Syracuse, led the Orange to a Northeast Region title with a meager 28 points. Syracuse also captured a conference title at the ACC Championships. Vroman, in his ninth year at Middle Tennessee, posted a victory at the South Regionals with a score of 71. The Blue Raiders also won a team title at the Conference USA Championships. Bucknam, in his 10th year at Arkansas, guided his squad to a South Central Regional title with 59 points. The Razorbacks were also SEC champions this year. Gary, in his sixth year at Furman, coached the Paladins to the Southeast Region championship with 55 points. Furman also won the Southern Conference title. Conner, in his 28th year at Portland, coached the Pilots to a West Region championship with just 63 points. His squad also notched a runner-up finish at the West Coast Conference Championships. McGuire, in his 26th year at Michigan, led the Wolverines to a Great Lakes Region title, scoring 71 points. His women also took home the Big Ten Championship title on the season. Gondak, in his fourth year at Penn State, guided the Nittany Lions to a Mid-Atlantic Region championship with a meager 31 points. Gondak’s team also finished fourth at the Big Ten Championships. Grove-McDonough, in her fifth year at Iowa State, coached the Cyclones to a Midwest Region title with 90 points. Her squad also won the Big 12 Championships team title. Wetmore, in his 23rd year at Colorado, led the Buffaloes to a Mountain Region championship, scoring a total of 62 points. Wetmore’s crew also won a title at the Pac-12 Championships. Treacy, in his 34th year at Providence, coached the Friars to a Northeast Region title with 84 points. His team posted a runner-up finish at the Big East Championships. Vanhoy, in his fifth year at Ole Miss, led the Rebels to a South Region championship, scoring 59 points. Vanhoy’s team finished in third at the SEC Championships. Harter, in his 28th year at Arkansas, guided the Razorbacks to a South Central Region title, posting just 35 points. Harter’s women also captured the conference title at the SEC Championships. Henes, in her 12th year at NC State, coached the Wolfpack to a Southeast Region team title, scoring 68 points. Henes’ team also took home a conference title at the ACC Championships. Lehman-Winters, in her 15th year at San Francisco, led the Dons to a West Region championship, scoring 59 points. Her squad also won the conference title at the West Coast Conference Championships.